Action across many limits and games. Cash games can be tighter than average. Little action outside No Limit Hold’em. Everest Poker is not available to US players. Everest Poker is a member of the iPoker Network. It is the sixth largest online poker network in the world, according to PokerScout. Everest Poker was once one of the largest standalone poker sites. Its software was terrible and it offered little in the way of promotions. This helped keep the player counts low, but the game quality was excellent. Everest Poker threw in the towel on its independent platform in November 2012 and moved to iPoker. It was on the iPoker2 platform when that setup existed. These days, all iPoker players are in the same pool. Everest Poker does not accept Americans. It did so briefly in 2006 before the Unlawful Internet Gambling Enforcement Act became law. It quickly placed the restriction on U.S. players after the law was enacted. Everest Poker was a standalone poker site that could not cut it as the industry declined. It sought a network to partner with so it could stay in business. iPoker was the answer at the time. There is little that differentiates them from other iPoker skins. The site abandoned most of its identity with the move. Everest Poker offers new players a 200% up to €1,500 first deposit bonus. New players also receive €10 in tournament tokens. The first deposit bonus clears in three phases. The first €5 releases after €5 in rake is paid. The next €15 clears at a rate of 50% rakeback. Any remaining bonus is paid at a 25% rakeback rate. The bonus releases in €0.50 increments. There are regular promotions that rotate with each month. This includes tournament series, freerolls and leaderboards. There is also a VIP program that is below par with the rest of the iPoker Network. There is no flat rakeback. Everest Poker is your typical iPoker skin. Low limit players will enjoy the easy bonus terms and free tournament tickets. Support is above average. There is ample action at No Limit Hold’em for all but the highest limit players. There are many guaranteed poker tournaments daily. Once a player has cleared €20 of the first deposit bonus, it only clears at 25% rakeback. The VIP program is below average. The traffic at iPoker is in decline. 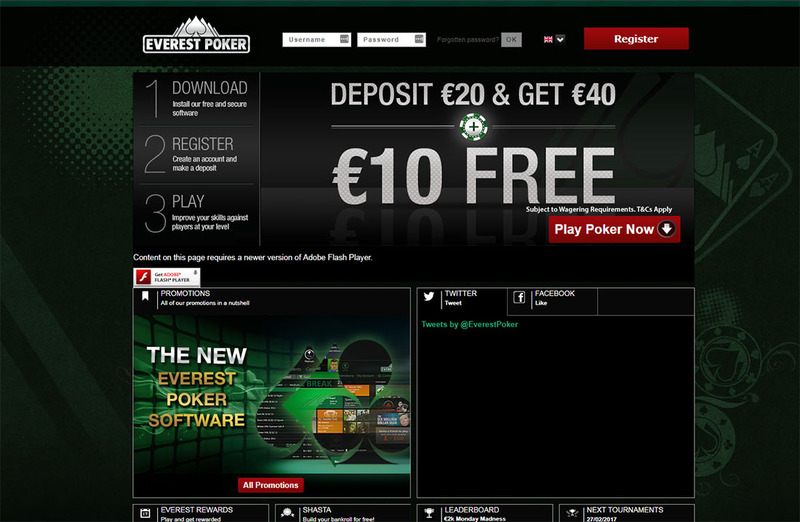 Everest Poker moved to iPoker in 2012. That was about the end of its relevance. There are no forum discussions at Reddit, Two Plus Two or other poker sites. This may be a sign of its loss of players after its move to iPoker. Many found better VIP programs and promotions at other iPoker sites. Everest Poker does not accept US players. This gives it access to more traditional forms of deposits and withdrawals. Bitcoin is noticeably absent from the their cashier. This is due to regulations in Malta and the United Kingdom that do not permit it for online gaming purposes. The minimum deposit and withdrawal is €10. Everest accepts a variety of deposit options that include debit cards, credit cards, ewallets and bank transfers. Many players choose Visa and Mastercard for deposits at Everest Poker. Neteller, Skrill, Entropay and PaySafeCard are available as ewallets. Electronic checks and bank wires are also accepted. Players looking to make a withdrawal will need to choose between Visa, Neteller, Skrill, check, electronic check and bank wire. Checks, electronic checks and wires are not available in all countries. They have been in business since 2004. It has never had any issues paying players. The site moved to iPoker seamlessly in 2012. We feel that Everest Poker is a safe poker site. There is a little concern about the lack of discussion of this poker room today. This shows that the site likely has far fewer players today than it did when it was a standalone site. Why is Everest Poker Legit? Any site that has never had a serious complaint against it in 13 years gets the benefit of the doubt, even if the brand is not a household name. iPoker skins tend to be safer than those on other networks. 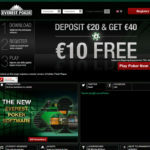 Everest Poker offers new players a 100% up to €1,500 first deposit bonus. It releases in three tiers. The first €5 clears at a rate of 100% rakeback. The next €15 is paid at 50% rakeback. The rest of it is worth 25% rakeback. The bonus releases in €0.50 increments. New players also receive €10 in tournament tickets. Everest Poker offers new promotions every month. These include tournament leaderboards, VIP freerolls worth €20,000 and point races. The VIP program is below average for the iPoker Network. There are eight tiers in the VIP program. Players that rake €5 in a month will receive 5% rakeback. It takes €300 in a month to break 10% rakeback. 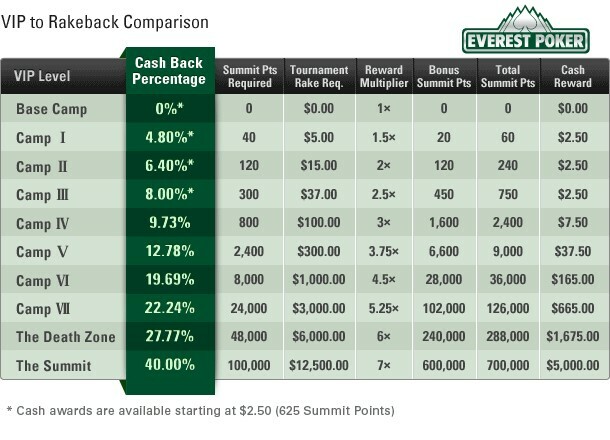 Everest Poker advertises a 40% rakeback tier. Very few players give enough action to ever reach that level. Everest Poker offers a wide variety of No Limit Texas Hold’em action. Blinds start at 0.02/0.05 and run up to 300/600. There is regular action up to 25/50. Pot Limit Omaha and Omaha Hi/Lo are spread from 0.02/0.05 up to 25/50, with most of the action below 5/10. Their poker room also offers Seven Card Stud, though there is very little action at these tables. Cash games are available with six and nine seats. Most of the action is at the shorthanded games. Everest Poker offers the full iPoker tournament schedule. This includes hundreds of thousands in tournament guarantees daily. The largest is the €200,000 guaranteed. It is held on Sundays at 18:00 GMT. The buy-in is €215. Other large tournaments include a €50,000 guarantee with rebuys and add-ons and a €30,000 Friday Freezeout. Has There Ever Been a Scandal at Everest Poker? Everest Poker has avoided all problems. The site pays players in a timely manner and has never been involved in a scandal in its 13 years of operations. What network is Everest Poker on? Everest Poker is a member of the iPoker Network. Is Everest Poker on the iPoker2 platform? There is no iPoker2 platform anymore. All skins share player pools. Is Everest Poker an independent site? No. They moved to iPoker in 2012. What is the Everest Poker first deposit bonus? New players receive a 200% up to €1,500 first deposit bonus. How does the Everest Poker deposit bonus clear? There are three separate clear rates for the deposit bonus. The first €5 clears at 100% rakeback. The next €15 equals 50% rakeback. The remainder is worth 25% rakeback. How does the Everest Poker bonus release? The bonus releases in €0.50 increments. 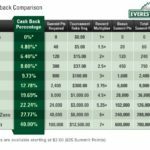 Everest Poker does not have rakeback. Instead, it offers a VIP program. Most players will receive less than 10% rakeback through the VIP program. The highest tier, which is nearly impossible to achieve, pays 40% rakeback.